Cast: Dominic Cooper, Samuel Barnett, Richard Griffiths, Stephen Campbell Moore, Frances de la Tour, Clive Merrison. Directed by Nicholas Hytner, adapted from Alan Bennett's stage play. Story: Boys learn history and get felt up by their teacher. The History Boys is a sticky pudding. I was hugely disappointed, but there are many of you out there who will appreciate it far more than I did - my job is to help you decide which camp you'll be in before you get there. Camp is indeed the word. Homosexuality is bandied around with gay abandon, as it were, in The History Boys. Maybe 1983 Yorkshire was like this in grammar schools - I'm too young, too common and too southerly to comment - but I struggle to see any band of boys, no matter how enlightened, being able to muse aloud and at length about their brown leanings in any school without getting their head flushed down the loo at break time. 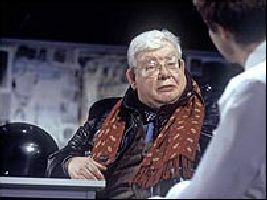 Furthermore, when it's revealed that Richard Griffiths regularly plays pocket billiards with the boys under his tutelage, no-one seems remotely appalled, except Clive Merrison as the most overacted headmaster since the days of St Trinian's. And his objection becomes somewhat muted when his hypocrisy is revealed - so the bollock-fondling is viewed as something of a minor eccentricity. Did I miss the curriculum change? Aren't we still supposed to be nailing these kiddy-fiddlers to the wall? Are we to believe that this actually goes on and, far more worringly, is condoned by colleagues and even the fondlees themselves? I'm beginning to realise quite how sheltered a life I've led. Quite glad about it, too. Although I found this aspect of the movie heavily disturbing, I shall set it aside for the moment. The majority of the story is about the boys' path to the hallowed realms of Oxbridge and learning the cunning ways of making the examiners think that they're smarter than they actually are. There's an ingrained sense of superiority, of smugness, that accompanies this journey that personally I find knee-jerkingly irksome. This is, perhaps, my own personal prejudice - and all the more annoying because I feel it infecting me. I've already rubbed out and rewritten several sentences in this review that sounded poncey - it's as if I'm trying to prove myself against this self-absorbed rabble. Must resist. Let's get all the negativity out of the way while I'm still feeling dirty. Being adapted from a play and using the same cast, the movie inevitably feels stagey. The classroom scenes are particularly at fault here - the lines are delivered too rapidly in succession and they're too loud, as if they're directed at the balcony. The discussions that occur in this environment don't feel spontaneous, they feel rehearsed (funny that) and the rhythm is all wrong. In one of the exterior scenes, the sound man's microphone even popped into to the top of the shot, for heaven's sake. I haven't seen that in a proper movie since I was knee high to a jockey. OK, enough barracking. There is plenty to be complimented about The History Boys. Richard Griffiths, the man who swallowed a space hopper without letting it down first, is a delight to watch and he effortlessly steals every scene he's in. Frances de la Tour, who I always thought was rather weak in Rising Damp, shows a subtlety I would never have imagined she was capable of and the script is genuinely amusing in places. There is a degree of cleverness, too, particularly in the French lesson, where almost the entire scene is conducted in French, but in such a way that the non-Gauloise in the audience can still understand what's going on. The intricacy of the script can at times go too far, with the kids spouting dialogue as if they were the most gifted improvisational poets ever to walk the face of the earth - that's just indulgence from scribe Alan Bennett. Dammit, I've drifted back into it again - WRITER, not scribe. This movie's turned me into a ponce. Time for me to shut up and sum up. In some ways, The History Boys is similar to Sideways inasmuch as it's prime dinner party conversation. However, Sideways had the major advantage of being a damn fine movie to boot, whereas this doesn't. If you prefer highbrow movies, I recommend it to you unhesitatingly, because you need to be able to talk about it, and to say that you've seen it. If that sentence seems daft to you, then you'll be better off with pretty much anything else. Imagine if Laurence Olivier was alive - what movie would he be talking about this week? If your answer wasn't, "who cares?" then give The History Boys a shot. I think the average moviegoer will enjoy it: 4/5 - I know this high mark contradicts much that I've said above, but I think that most people who go and see this movie will be the right kind of people to enjoy it. To enjoy this film you should be: able to transcend the technical issues and be absorbed in the story. The History Boys was released in the UK on 12th October.